Storing your reviews in OwnerRez is very important. Learn why by reading our Reviews Overview article. Then learn how to store your reviews in OwnerRez. Once your reviews are stored, you'll want to know how to access and use them. Here at OwnerRez, we develop features around open standards and the principle that your data should be able to be exported or taken with you. This is sometimes referred to as Data Liberation in the industry, and it's something we apply to reviews as well. To get started, click the global Reviews menu. 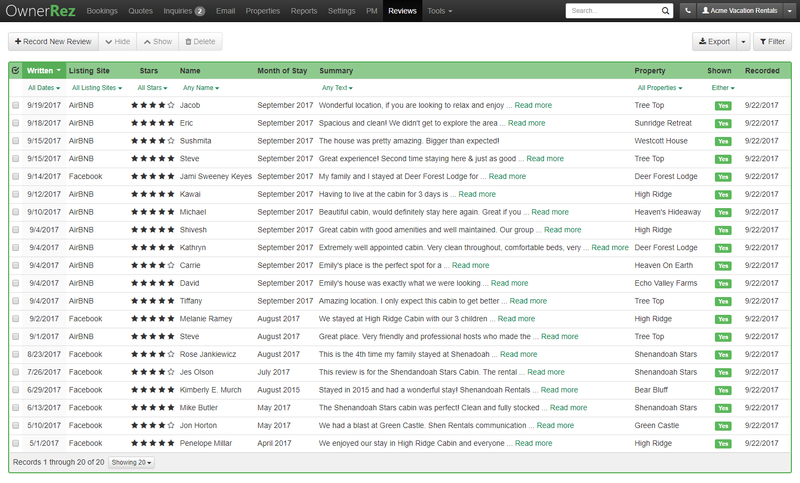 This will open a full page grid, showing all of your reviews in OwnerRez. ...and many other types of searches. We make that easy by exposing a variety of filters in the grid. At the top right of the grid, click the Filter button. You can then read those reviews or export them to Excel to use elsewhere. If the reviews are associated with bookings, click through to the booking to see more about the booking in question or contact the guest directly. Exporting reviews is similar to how you export bookings, quotes and other things in OwnerRez. Above the reviews grid, click the Export button and select the type of file format you want to download.